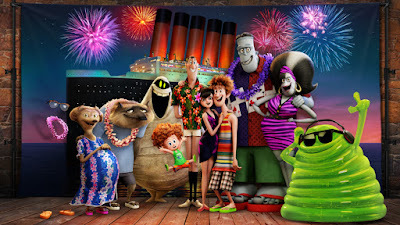 Mavis takes Drac and all their monster friends and family on a surprise cruise after Drac tells her he is overworked. In reality, he is just lonely and is looking for someone to "zing" with to fill the void in his life. 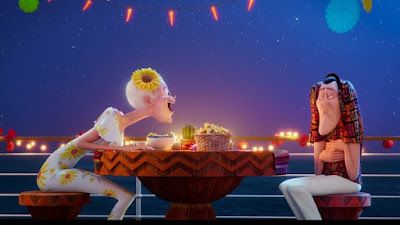 On the cruise, Drac thinks he has made a romantic connection with a woman named Ericka, though she may have some secrets that could put a damper on their relationship. 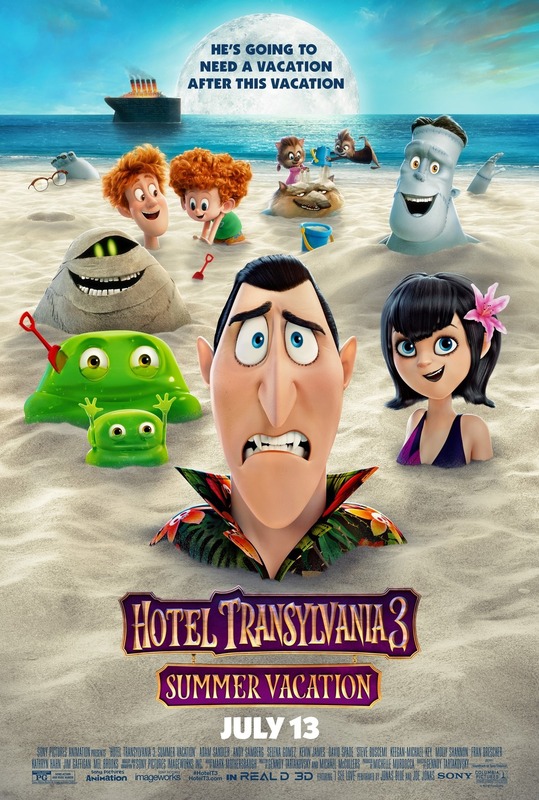 Of all the Adam Sandler-led films released in the last decade+, the movies in the "Hotel Transylvania" series are probably the most tolerable. "Hotel Transylvania 3: Summer Vacation" is directed by Genndy Tartakovsky, who has helmed the entire "Hotel Transylvania" series as well as TV shows like "Samurai Jack," "Star Wars: Clone Wars," and "Dexter's Laboratory." Tartakovsky also takes over writing duties for this installment along with Michael McCullers, who was a writer on SNL and movies like "Austin Powers: The Spy Who Shagged Me" and "Austin Powers: Goldmember." All of the members of the cast return to lend their voices to this third installment in the franchise. This time around, Drac (Adam Sandler) is feeling a bit lonely and is hoping to find love once again. He doesn't want to admit to his daughter Mavis (Selena Gomez) how sad he has been. Instead, he tells her that he feels overworked and that he doesn't get to spend enough time with the family. In response, Mavis books a cruise for all of their family and friends so Drac can have a vacation. Luckily for Drac, he seems to have met the ideal woman on this cruise, the captain of the boat, Ericka (Kathryn Hahn). Unluckily, Ericka may have a secret that will make their match-up not-so-smooth-sailing as they may have a few rough patches to get over before they can fully "zing" together. The "Hotel Transylvania" series has had a pretty consistent message since the beginning, which is learning to tolerate those who are different. It is all about letting go of the fear and hate that has plagued your past and taking the time to look at things from a different point of view. It just delivers this message in between an occasional fart joke and a goofy dance routine, but c'mon, it is a movie for kids after all. Despite that these films have never been the greatest animated movies we've ever seen, they are always enjoyable for the most part. We laughed pretty consistently throughout this installment, just like we have with the other entries in the series. We never laugh hysterically, and it doesn't really ever hit a strong emotional chord, but it is at least entertaining. Sure, there are a lot of physical sight gags and the occasional body excretion joke, but once in a while, there is a really clever pun or quip or situation that speaks to the adults in the audience. "Hotel Transylvania" has always had a large assortment of characters, and fans of the series may see some of their favorites getting left in the fray because this is, and has always been, the Drac Show™. Every character gets a little something to do here and there, but the writers had to pick and choose their battles, and some fan-favorites who have been more prominent in the past have had their screen time cut way, way down to make room for more Drac Drama™. There are also a few callbacks and recycled jokes, but these throwbacks balance out the characters and situations that are unique to this installment. There's not much to say about this movie, everyone. It's fine in every possible way. If you enjoyed the first two films in this series, chances are you will find things to enjoy about "Hotel Transylvania 3: Summer Vacation."